Phillies manager Pete Mackanin mentioned prior to Tuesday's contest in Miami that the club is evaluating the possibility of sending Maikel Franco to Triple-A Lehigh Valley. The 24-year-old showed promise last season, swatting 25 homers to go along with 88 RBI RBI. This season, however, he's been an utter disaster at the plate, stumbling to a .209/.268/.349 slash line with just six home runs and 28 RBI in 190 plate appearances. 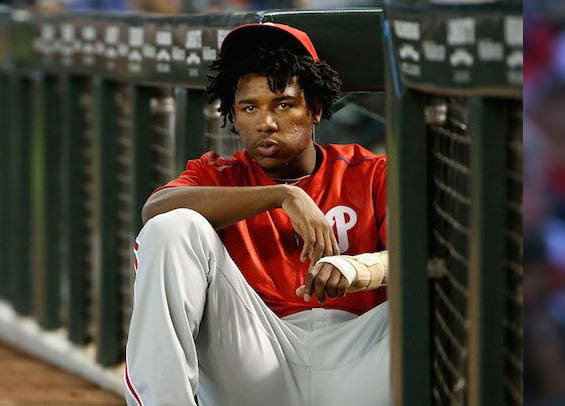 "He's in a funk and you can tell he's down on himself," Mackanin said over the weekend. "He's in a tough spot, but he needs to fight his way out and get the confidence back." Mackanin benched Franco last week while the Rockies were in Philadelphia, but he's gone just 2-for-18 since rejoining the lineup. A demotion to Lehigh Valley isn't a terrible idea. Ideally, the move would relieve some pressure from Franco and let him work on his swing and approach at the plate. Successful hacks - anywhere right now - is a good thing. Secondly, and perhaps most importantly, a move like this will test his mental makeup. Will he accept the demotion as an opportunity to regroup and improve, or will he sulk and question the decision. If Franco openly questions the move then it's doubtful he's someone the organization will want around when the rebuild concludes. If, however, he takes the move in stride and excels, it'll say a lot about his mental makeup and he'll be stronger for spending the time away from Citizens Bank Park. Adversity, if managed properly, can be a good thing for players and a ball club. If the Phillies view Franco as a significant piece of the rebuild then seriously considering a demotion makes sense. As an organization, it's like protecting an asset - an asset getting pummelled at the plate nightly, from both pitchers and fans, with no turnaround in sight. Given the circumstances, a temporary move to Lehigh Valley may be the best card to play for Franco and the Phillies.